to its boring verse­-end half­-rhyme of death. too late for all time with the right thing to say. Heller’s ‘Printmaking Today’ had us both in fits. blind as Blake’s Newton to all but my compass. pushing into his eye, unweaving his rainbow. like a window blind onto a summer’s morning. Read An Interview with Ian Duhig on our blog. 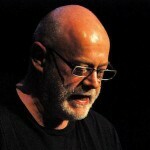 Ian Duhig has written six books of poetry, most recently Pandorama (Picador 2010). He has won the Forward Best Poem Prize, the National Poetry Competition twice, and three times been shortlisted for the T.S. Eliot Prize. A chapbook of work from his Digressions project based at Shandy Hall will be published this year.